As an album, Beautiful is actually a less wild, ethereal offering than Welch’s previous offerings, with fewer harps and tribal drums. Instead, it’s a more personal and direct with some breathing room that allows those distinctively Florence moments of unrestrained lungpower to shine. At 29 years old, Welch has already matured greatly as a vocalist, performer, and songwriter, still passionate and mesmerizing as ever but exhibiting more sanguine strength than ever before. She owes some of that growth, she said, to what she has experienced in Los Angeles. Here are three more things we learned at the first of Florence + The Machine’s two magnificent “homecoming” shows. The title track “How Big, How Blue, How Beautiful” is inspired by a previous show at the Hollywood Bowl. Her early hit “Cosmic Love” was written during a terrible hangover in Crystal Palace, London. “This song was written in a place not known for blue skies, called Crystal Palace. It was one of the first songs I ever wrote, and I was so hungover, the most hungover a person has ever been,” Welch said, glancing at the magnificent stage behind her—a giant shimmering tile mosaic hanging behind her 11-piece band—and joking that the crowd can see she isn’t a person who does anything halfway. Bandmate and songwriting partner Isabella Summers told her she wasn’t allowed to lie down. She had to write a song. You shouldn’t attend a Florence + The Machine show unless you’re willing to ditch an article of clothing and (potentially) kiss a stranger. 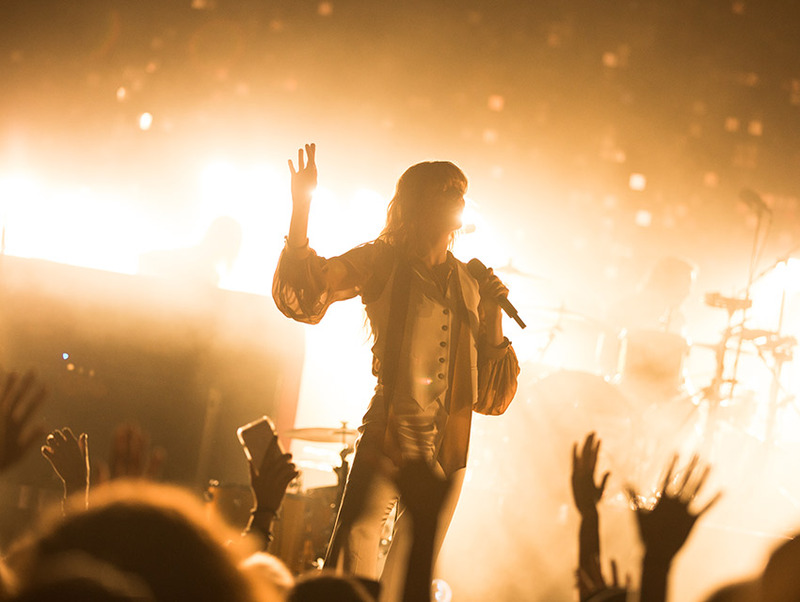 Florence + The Machine plays tomorrow night at the Santa Barbara Bowl.